1. A ten-step system designed to help any person or family get the information and items they need, keepsakes they treasure and people they love through nearly any disaster, and back to their normal lives, as quickly and easily as possible. 2. 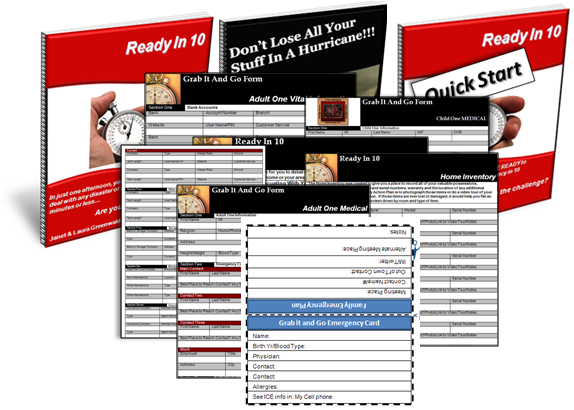 With Ready in 10, you can be prepared in one afternoon even if you’re completely disorganized and have never been through a real emergency in your life. What Do I Get With The Ready In 10 System? *The electronic version of the Grab It & Go Forms, Wallet Cards and Checklists/Plans can be saved and filled in for multiple adults and children. Is Ready In 10 Right For Me? The unique thing about Ready In 10 is that it’s designed to work the way you need it. Are You A Type 1 Person? You live in an area prone to certain disasters, like hurricanes, earthquakes or tornadoes, or you simply want you and your family to be prepared. Your goal is to have your Ready In 10 Plans completed, in their notebook and ready to grab and go. Or Are You A Type 2 Person? You’re facing an imminent emergency. They’ve just issued a hurricane warning for your area, or the river near your home is reaching flood stage. You just found Ready In 10 and need a plan ASAP! The Ready In 10 System works no matter what situation you’re in. 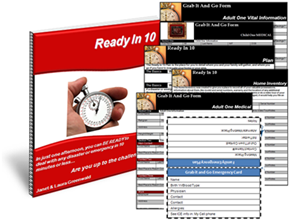 Ready In 10 is broken down into three parts, the 10 Step Quick Start Guide, the Plans & Checklists, and the Ready In 10 book. If you’re a Type 1 person, begin with the Quick Start Guide, and work through each step. The steps themselves should take about 10 minutes each to complete. Then when you have time, go back and fine tune your plans, to make sure that you and your family will have everything you need for future emergencies. If you’re a Type 2 person, go through the Quick Start Guide to get a general idea of what each plan or checklist does, gather all of your vital documents and information, open and complete or print and fill in the Grab It An Go Vital Documents form, Medical Information Form, Ready In 10 Evacuation Plan and the Get Back To Life Plan. Then when the crisis passes, go back, read the book and fine tune your plans, to make sure you have everything you need for future emergencies. Grab it and Go Forms. Wallet Cards, Emergency Action Plan, Home Inventory and Get Back To Life Plan right in the book, so you can fill them in and toss them into your emergency bin for safekeeping and easy access. 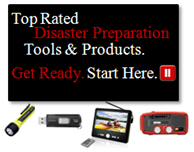 A link to an electronic version of Grab it and Go Forms and Wallet Cards for each member of your family PLUS your Emergency Action Plan, Home Inventory and Get Back To Life Plan, so you can save your plans and information to your hard drive, flash drive, or have them available remotely for easy access in any emergency. NOTE: When you receive your book, in the first few pages, you'll find a link where you can go and immediately download all of the forms, plans and extras that come free with this book. There’s only one difference between family one and family two. And that difference is a plan. Once you decide which family you’d rather be, purchase Ready In 10.